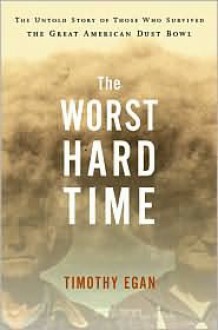 The dust storms that terrorized the High Plains in the darkest years of the Depression were like nothing ever seen before or since.Timothy Egan’s critically acclaimed account rescues this iconic chapter of American history from the shadows in a tour de force of historical reportage. Following a dozen families and their communities through the rise and fall of the region, Egan tells of their desperate attempts to carry on through blinding black dust blizzards, crop failure, and the death of loved ones. Brilliantly capturing the terrifying drama of catastrophe, Egan does equal justice to the human characters who become his heroes, “the stoic, long-suffering men and women whose lives he opens up with urgency and respect” (New York Times).In an era that promises ever-greater natural disasters, The Worst Hard Time is “arguably the best nonfiction book yet” (Austin Statesman Journal) on the greatest environmental disaster ever to be visited upon our land and a powerful cautionary tale about the dangers of trifling with nature. It's not a bad book, but it's very history-y. I need mine wrapped up in cheese before I can chow down, sadly.